So when my mom came to spend Christmas with us this year, I decided the time had come for us to make it together so that I could say good bye to store bought gnocchi once and for all. Making it with her, I was amazed at how much simpler it was than I remembered and amazed at how I had ever managed to convince myself that those dense little balls that come out of the package were 'pretty good'. Our gnocchi turned out amazing, beyond amazing actually. And from the number of times that all of us, including the friends we invited over to enjoy this meal with us returned to the pot for 'just a little bit more', I think this rating was shared by all. Now like all good Italian recipes, some of the quantities below are suggestions and as my mother says when I ask, "How do you know if you will need the full 6 cups of flour? ", she replies "You can tell by the touch." 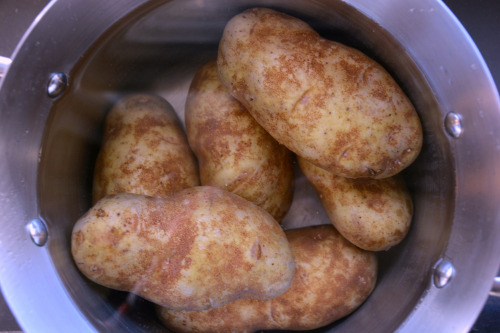 Gently wash and scrub your potatoes and place in a large pot and cover with water. Bring water to a boil over high heat and boil potatoes until you can poke them with a fork and the fork travels smoothly through the potato. Drain the potatoes and allow to cool slightly (enough that you can handle them without burning your fingers) but not completely. At this point the skin should peel off the potatoes smoothly. Discard the peel. Place the potatoes in a bowl and add the 2 tbsp of milk and mash. If your potatoes feel runny or watery, place them in the oven on a low temperature for 10-15 minutes to dry them out a little bit. This step will help you eliminate some of the flour you will need to use and you will end up with a fluffier gnocchi. Our potatoes were perfect, so we did not have to do this step. To get a nice, light and fluffy gnocchi you really need to put them through a potato press to get rid of any clumps. Once all of the potatoes have been pressed, stir in the salt, eggs and a couple of cups flour and mix together. This is where you need to start to go by feel. Once you have completely mixed in those first few cups of flour, you pick up a small amount of the mix and roll it gently in your hands. If it rolls smoothly and without any of the potato mixture sticking to your hands you know you have the right consistency. If this does not happen, add another cup of flour and mix thoroughly and try rolling it in your hands again. Once you have reached the desired consistency (we only ended up using 4 cups of flour) you will want to transfer to a larger work station. We covered my dining room table with a large cloth so we could start rolling and forking the gnocchi. Now while my mom did all the work that requires skill and finesse, I had the easy job of taking the little pieces she was cutting up and rolling them gently off a flour covered fork onto the cloth we had covered the table with. Sprinkle flour over the gnocchi and cover with another cloth until it is time to cook them. This part took my mom and I the better part of an hour, which is what I think made the process feel daunting in my mind. But it was actually quite lovely. We talked and laughed and the work made us look forward to the meal we were about to have once all the work was done. To cook the gnocchi bring a large pot of water to a boil and drop the gnocchi in slowly, stirring as you drop to ensure they don't stick together. When the gnocchi have cooked they will all start to pop up to the surface of your water. This doesn't take long. Once they have all risen, drain and rinse and add to your sauce and serve. But be prepared to stand up several times and refill plates, because trust me - you and your guests will want more than one serving.